A world famous city and perennial tourist favorite with a justified international and national reputation as one of Germany's top tourist destinations. The city's urban development, its university life, many fine restaurants, shopping opportunities, cultural offerings and wide variety of annual events all contribute to the worldwide popularity of the city which even Goethe felt had something "quite ideal". Situated at the banks of the Neckar river and overlooked by the beautiful castle, you will sure fall in love with this amazing city right away. Every year, around three million people visit Heidelberg, which makes it the number one tourist attraction in Germany. 700 years of history and a dwarf who could hold his drink? Yes, the main attraction for all visitors, of course, is Heidelberg Castle, perched on the slopes of Mount Koenigstuhl some 70 meters above the Neckar river. It's easy to see why, too. The castle and its neighboring buildings are among the most impressive sights anywhere in Germany. During your guided tour you will appreciate the history of the castle, which has experienced its fair share of ups and downs over 700 years. To get them through these turbulent times, it's likely that the lords of the castle would have made regular use of the royal wine cellar. This is home to the biggest wine barrel in the world! Made from 130 oak trees, it is eight yards wide, over nine yards in length and has a capacity of precisely 55,345 gallons! For a time, the Elector Karl Theodor employed the Italian court dwarf "Perkeo" to guard the barrel. Perkeo's name is said to have been derived from his foundness for drink. Whenever anyone asked him if he would like another glass of wine, the answer came back "perche no? ", which means "why not?" in Italian. Make sure you stroll through the beautiful gardens and take pictures from the city laying to your feet! From the castle a path takes you straight down into the old town. 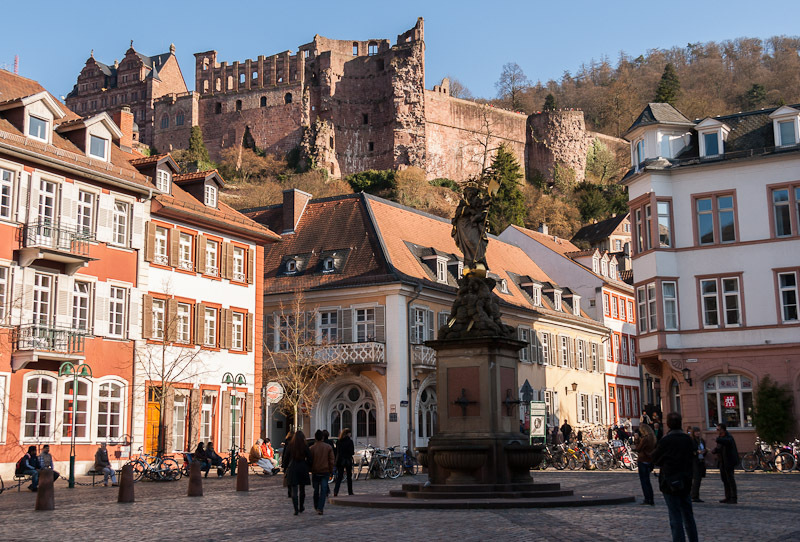 At the center of this is the market square where you'll find one of Heidelberg's beautiful fountains, grand period houses, lots of cafes and even more little shops. Towering above this delightful scene is the famous Church of the Holy Spirit. From here it's just a stone's throw to Kornmarkt, for many locals Heidelberg's prettiest square. The Madonna from 1718, who is held aloft by angels atop a fountain pillar, was meant to entice Protestants to return to the "truth faith" following the Catholic Revival. Today we can all enjoy the statue, which together with the castle forms one of the town's most popular postcard motifs. The next square, Karlsplatz, is also decorated by a fountain which offers a playful take on the famous humanist and cosmographer Sebastian Muenster. That such feats should be honored reveals much about Heidelberg. Because over the course of the centuries a great many scholars have shaped the intellectual and cultural ideas of this former electoral seat. Georg Wilhelm Friedrich Hegel, Robert Bunsen, Max Weber and Karl Jaspers, for example, are just some of the famous names who have studied or taught at the university - the oldest on German soil. Today, around 28,000 student are enrolled here, and although they work hard, it's not uncommon to see them in the numerous cafes and bars. Because drinking is another Heidelberg tradition, as you can experience for yourself over a glass of wine or a home brewed beer in beautiful old student pubs such as "Zum Seppl" or "Zum Roten Ochsen". After this fun filled day, you will sure say as many more visitors and locals said before: I lost my heart in Heidelberg! Just as Fred Raymond's famous song does.